Today I’ll talk about one of the indications that more companies are jumping into the voice bandwagon: the Guardian announcement yesterday: Voice Lab. According to the press release in the Guardian website, the goal is to bring the authentic voice of the Guardian to Google Assistant through experimentation and innovation. The Guardian is looking to create immersive interactive stories leveraging emerging technologies. In partnership with Google, our dedicated multidisciplinary team of journalists, developers and designers will create and test innovative voice-driven audio experiences for the Google Assistant. There are no examples for now as the article exhorted to come back to the page for updates. However, it’s a relevant announcement for media companies. This is not the first time that I talk about media companies leveraging voice technologies and experimenting with audio and smart speakers, BBC, NYT and HuffingtonPost Canada, either have voice applications in one of the leading platforms and a lot of other media companies have flash briefings. I’m definitely excited to see how this new combination of mediums changes journalism and storytelling. 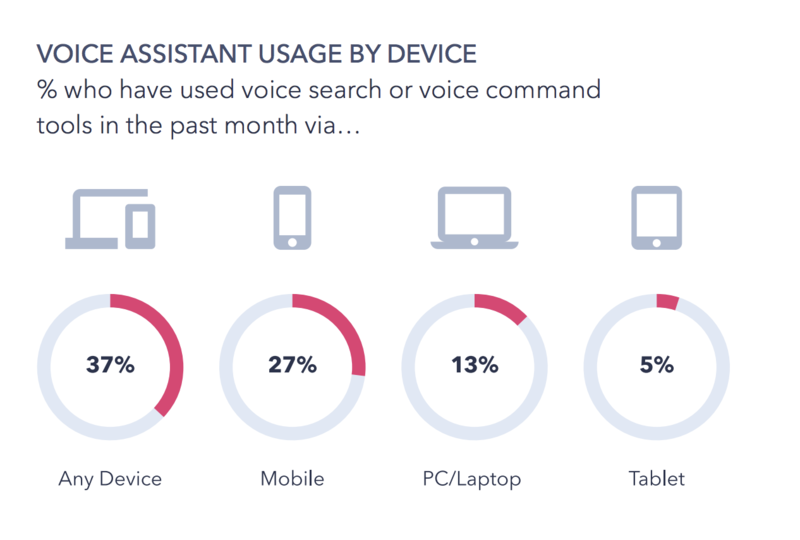 Global web index released last week a report on Voice Search: trends to know, a deep dive into the consumer uptake of the voice assistant technology. I summed up the main points. 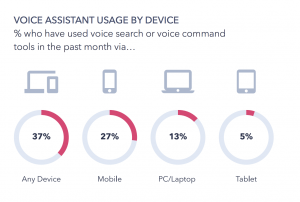 27% of the global online population is using voice search on mobile. It’s most popular in Asia Pacific, but 16-24s in mature English-speaking markets aren’t far behind. Mobile voice has the strongest ability to scale voice tech adoption at a continued rapid pace. Between 40 to 60% of consumers planning to purchase a new mobile or upgrade their existing handset in the next 12 months, the majority of their new phones will have integrated voice assistants. 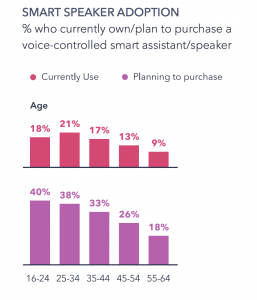 17% of internet users currently own a voice controlled smart assistant, and 34% said they are interested in purchasing one. Privacy is a major factor for voice tech. The report establish unfamiliarity among consumers with how their data is stored and how they may access this data as the main concern. Advise to brands to be transparent with consumers over data collection in voice tech. 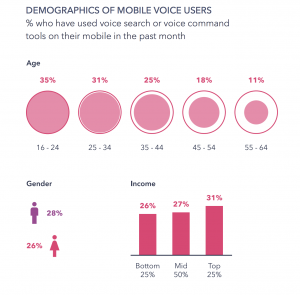 Consumers have a wide range of voice-powered search services at their disposal. From Siri to Cortana to Google Assistant to Baidu DuerOS. Voice enabled smart speakers and voice assistants on mobile are the primary interfaces consumer use to engage with voice tech. Ages 16 – 34 a combined 66%. The important trend in the chart is how mobile voice is driven by younger internet users. More than 2 in 3 Mobile Voice Users fall within the 16-34 age bracket, giving us a clear indication of the trajectory of growth in the mobile voice market. From a market-by-market perspective, the Global web index data shows that mobile voice search is being driven by Asian markets, with the strongest figures by Indonesia (38%), China (36%) and India (34%). One of the biggest obstacles smart speakers have faced is in convincing consumers that they are an essential rather than a nice-to-have device. This is in part being erased by third party applications for consumers, giving brands the power to engage or sell in a convenient way. Expedia is the most recent example that I featured here a few episodes back. Similar to mobile voice, ownership and intent to purchase is concentrated among younger age groups, but it’s still a significant number of older consumers who say that they plan to purchase one of these items in the future. Clearly, there is a widespread awareness of how these devices can bring value into everyday activities which spans across age and income groups. A key factor in increasing this awareness has been aggressive promotional and discount periods during holiday seasons – especially from the likes of Amazon – in ensuring that these devices are available even to the more modest budget. Another key takeaway from the report is the prolonged interest in smart speakers as they approach their fourth year on the market providing a promising outlook in the longevity of consumer uses cases of these devices. The balance between convenience, privacy and security for new technologies like voice search often rests upon brands being transparent with their customers. Global web index outlines social, transparency and affordability as the main implications for the future of voice tech. For the consumer research company Amazon is clearly ahead of the competition and that should serve as a warning for both new and traditional competitors. Alexa everywhere, soon available in office equipment. Amazon said a couple of weeks back that it debuted a new feature that lets office equipment makers more easily integrate their existing devices like video-conferencing gear and corporate calling headsets with the Alexa voice assistant. Makers will use Alexa for Business. Some of the companies that are working with Amazon on the new feature include BlackBerry, iHome, and Plantronics, which owns the corporate device maker Polycom. Amazon has recently invested in prefab houses company Plant Prefab through their Alexa fund as well as healthcare (Aiva) and education (BambooLearning) , truly looking into Alexa everywhere mentality. Details by VentureBeat. Happy Sunday to you all! This is VoiceFirst Weekly daily briefing, I’m Mari as always you can find me on Twitter where I live the most as voicefirstlabs or mlescaille and on Instagram as voicefirstweekly. Why Alexa Presentation Language might be the biggest news right now for voice apps? For developers and anyone involved in the mobile revolution around 2010, anything that promises to work in different devices seamless is like a dream. That’s what Alexa Presentation Language is seducing us with: build interactive, multimodal Alexa skills and customize them for different Alexa-enabled devices. The language comes with tools for testing and a simulator. It’s like Amazon said we are going to do better this time. I have yet to try the feature but I’m already extremely excited about it. Optimized for Alexa-enabled devices, it also ensures that your skills can reach customers on Echo Spot, Echo Show, and Fire TV. You hear that, 3 devices with disparately screen sizes and shapes. The #Alexa Presentation Language is a huge change to how developers build for displays. With Christmas bringing more Echo Shows and Fire TVs, there's a lot to learn quickly. Still I don’t think a lot of devs are taking this as the huge step it represents for the future of voice applications. The finish line has been moved, is what devs will grow accustomed to and that’s a great thing. Building experiences powered by voice, visuals and touch is the true multimodal rich voice apps we all want. This is what I love about Alexa and what Amazon is building: it’s a platform for others to build on, not as much a product. It is our product, what you build in it contributes to its base as much as the base itself. If you are just hearing about Alexa Presentation Language, I sent in this week’s newsletter a guide about it that you need to check out. I will come back to APL in a few months when the impact will have measured better and users report on their experiences. Happy Saturday! My name is Mari, This is VoiceFirst Weekly flash briefing. You can find me on Twitter as voicefirstlabs or in Instagram as voicefirstweekly. Have a nice Friday and I’ll talk to you tomorrow! Is Siri an enterprise product already? I’m going to start saying it: I’m one of those who is not completely counting on Siri in the smart speakers race. After all, despite being one of the first in the market and having the mobile advantage (as I like to call it), it doesn’t seem to catch up to the times, or have any interest to do so really. The recent Apple events have not release me from that thinking until the Salesforce partnership was announced. Is Siri an enterprise product? ComputerWorld published an article yesterday that had a different view from other tech writers blasting on the assistant. The premise: Siri is already and enterprise product and here’s why, and goes on to explain in detail. I’ll spare you of those in this episode, the too long didn’t read line is about privacy and how Siri handles the requests. Implying that even if users are willing to give up privacy for other services, enterprise users are not. Hey Siri, update the opportunity information and reduce the customer success warning from Red to Green. Remind me in 2 weeks to follow up that all of our actions have now been completed. Send an email to the customer and thank them for buying lunch. And Play U2 ‘Beautiful Day’. I’m all about the argument for privacy and clearly Apple is pushing hard on it. In the recent International Conference of Data Protection and Privacy Commissioners in Brussels, Cook took a very strong strategic position over privacy. Blasting other big companies over recent scandals and management of user’s data. If this is going to be the only argument for Siri as an enterprise product, then let’s keep going with it. (Let’s clarify that I do agree to some extent to the premise of the article, to the extent that I don’t is the following). Google and Facebook are the [big] companies recently involved in user’s data scandals and probably the ones you could argue collect the most data from users for their core business. However, individual users trust Google every day with countless of services and more data, companies do the same (Gmail 1.5 billion users?, Google Cloud, etc). Amazon on the other hand, is the first cloud services provider and enterprises already trust their most important assets to AWS Services. The API model is here to stay, probably an overdue statement at this point, but follow me here, and the fact that to build for Siri you have to explicitly partner with Apple, as opposed to build and launch an Action or Skill might be a problem to consider too. Note that I didn’t mentioned how Siri perform compared to other smart assistants which can open another line of thoughts. Is Siri an enterprise product? It seems so per Salesforce integration. But I think there is a bigger question here and it’s will privacy matter so much to influence that much in the market of smart assistants? Love when questions lead to more questions. My name is Mari, This is VoiceFirst Weekly flash briefing. You can find me on Twitter as voicefirstlabs or in Instagram as voicefirstweekly. Have a nice Friday and I’ll talk to you tomorrow!